A serpent star, Asteroporpa cf. annulata, clings to the skeleton of bamboo coral. Serpent stars, basket stars, and brittle stars all fall within the class Ophiuroidea. Image courtesy of the NOAA Office of Ocean Exploration and Research, Gulf of Mexico 2017. Download larger version (jpg, 638 KB). 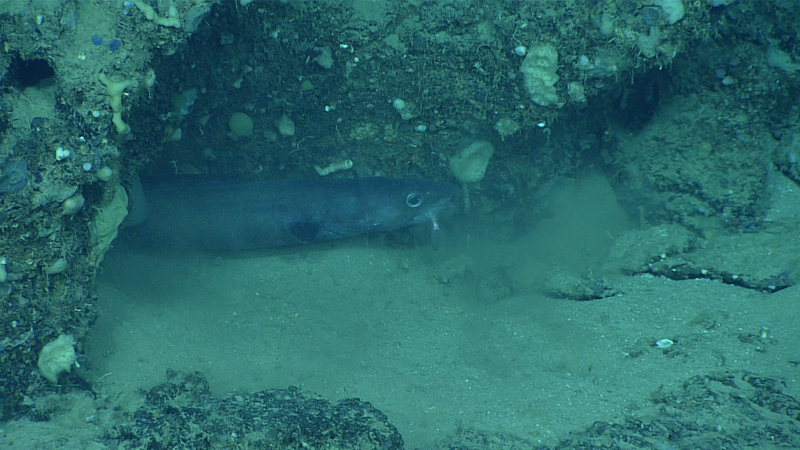 This congrid eel was observed eating a smaller fish. During the dive, we saw nearly 15 different species of fish. Image courtesy of the NOAA Office of Ocean Exploration and Research, Gulf of Mexico 2017. Download larger version (jpg, 1.0 MB). 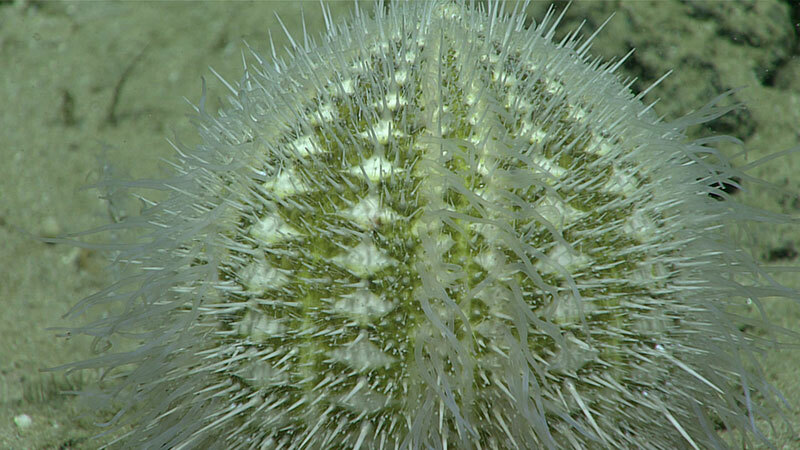 Beautiful Gracilechinus gracilis urchins are typically found on hard substrates in the Gulf of Mexico and northwestern Atlantic Ocean. Here you can see the tube feet are extended! Image courtesy of the NOAA Office of Ocean Exploration and Research, Gulf of Mexico 2017. Download larger version (jpg, 915 KB). This armored searobin (Peristedion sp.) attempted to scare off the Deep Discoverer during Dive 04. The dive was relatively shallow for the Okeanos, so we observed life not usually encountered on deeper dives, including a high diversity of fish species. Video courtesy of the NOAA Office of Ocean Exploration and Research, Gulf of Mexico 2017. Download larger version (mp4, 27.9 MB). Dive 04 took place on the West Florida Escarpment, within a proposed Habitat Area of Particular Concern, beginning at 410 meters (1,345 feet) and ending at 383 meters (1, 256 feet). Given the relatively shallow nature of the dive, we observed life not usually encountered on deeper dives, including a high diversity of fish species. 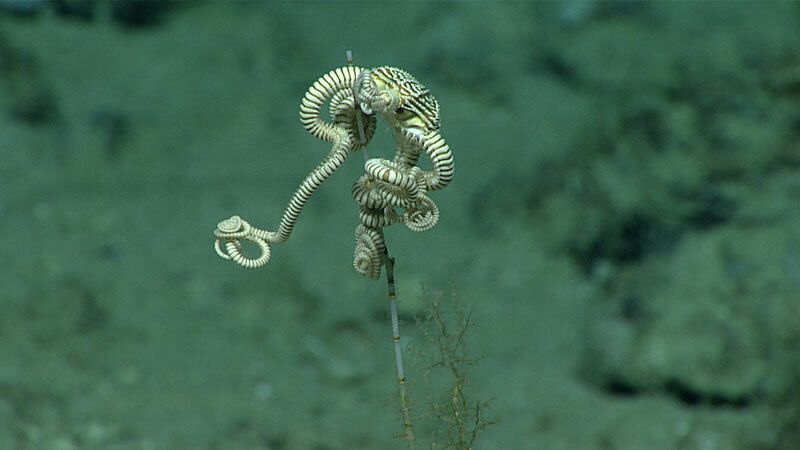 As remotely operated vehicle Deep Discoverer climbed the escarpment and crossed the exposed top edge, fauna transitioned from mostly small encrusting sponges to a diverse suspension-feeding community composed of many bamboo and black corals, and finally to a field of bamboo corals on the shelf top. Notable benthic observations included a congrid eel that captured and ate a smaller fish (Serranidae sp. ), a glimpse of a swordfish, a shallow xenophyophore, a young basket star (Gorgonocephalidae sp. ), and many live pterobranchs (tiny, colonial, filter-feeding relatives of acorn worms) amongst corals on the upper crest of the escarpment. Most of the science team, both onboard and on shore, had never seen a live pterobranch, so this was particularly exciting! Due to issues with the ship’s dynamic positioning system, a large part of the dive was spent in the water column, where we observed species of coronate jellies, pyrosomes, larvaceans, siphonophores, and ctenophores.